This sponsored series is brought to you by FiveF. The first in a new three-part series focusing on ration alkalising options. Feed eﬃciency in dairy cattle is more important than ever in the current climate, and it was one of the main factors which required a rethink when the Evans family looked at ways to improve the performance of their dairy herd back in 2012. This overhaul of the business - based at Priddbwll Mawr, Llangedwyn, Powys – was initiated by Martin’s son James coming back from university to work at home. James says: “At that time, we were milking 300 cows, twice daily, but it was clear they were not performing at their best. Yields would reach an annual average of 9,500 litres, but would then fall back down again, and calving intervals were at 435-440 days. “The ground here is heavy, so we would graze for five to six months of the year and feed substantially through winter. We really needed to reassess everyone’s role within the business and look at how all aspects of the farm could be made more eﬃcient,” he adds. For that job, the family called in the help of FiveF Alka nutritionist Malcolm Graham. With regards to the cows’ diet, he concluded the use of wet, acidic forages were aﬀecting digestion, and the high acid load was, in turn, impacting on body condition and fertility. This is a sponsored series brought to you by FiveF. To combat the acidity problem, he advised the use of the company’s AlkabupHa – a 90% protein alkaliser, which is added to the TMR ration while in the wagon. “AlkabupHa is unique as an alkaliser, as it works by reducing the acidity of the feeding before it is eaten by the cow. It is a high protein feed that releases ammonia in the TMR wagon, which reacts with damp forage sources and raises the PH levels. “This helps the rumen work more eﬀectively and allows higher feed intakes, without the need for expensive ingredients within the diet,” he adds. 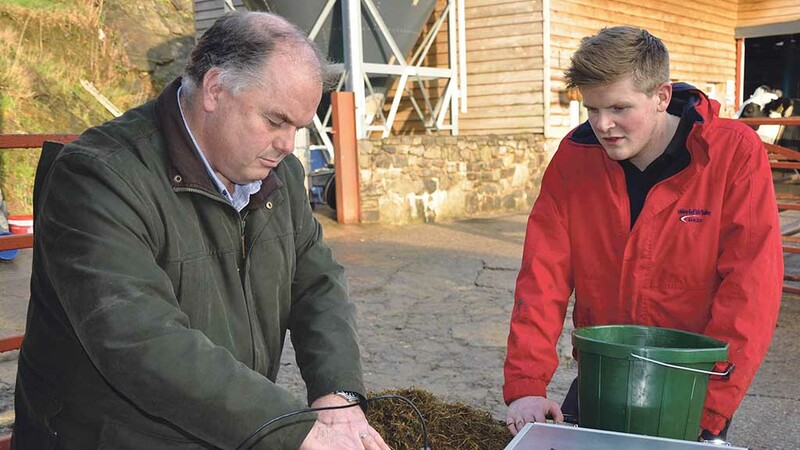 James says improvements in the performance of the cows were noticeable immediately at Priddbwll Mawr and the use of AlkabupHa has given them more confidence to increase the starch in the cows’ diet, which has helped increase yields. “The cows are now producing 11-11,500 litres on average and their general condition is far better. It is also a good source of protein, which has contributed towards a cut in feeding costs,” says James, who is now in charge of the day-to-day running of the dairy side of the business, alongside a team of three others. Further improvements at the farm, including a focus on fertility and reducing the age of first calvers from 27 to 24.5 months, have allowed the Evans family to expand the herd up to 520 cows, now milking three times a day. They are now calving 55-60 animals a month, compared to six in June 2012. Total feed and forage costs have reduced from 15.8p per litre, to 11.4p, with the purchased feed cost dropping from 11.7p to 8.7p. Profit has been boosted as a result. 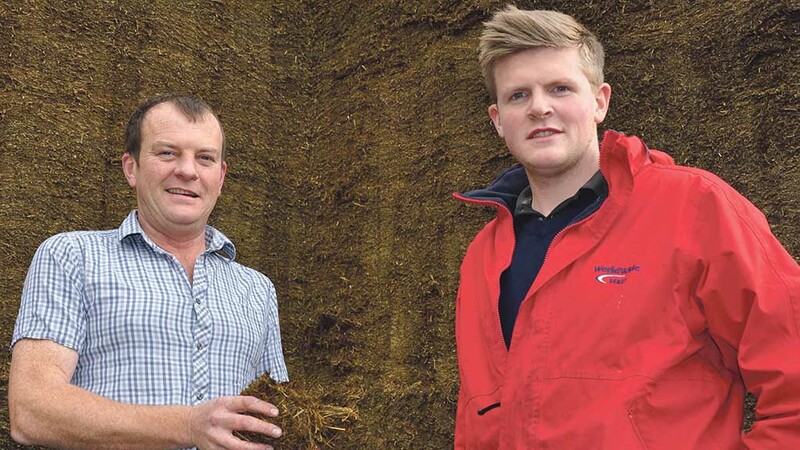 “Using AlkabupHa has been crucial in improving the rumen function of the cows, which has allowed us to improve herd performance without increasing feed costs,” explains James. “We definitely lacked vision before, but this restructure has allowed us to get the best out of our herd. With milk prices as they are, we are still struggling we are standing still – but if we hadn’t changed our system, we’d be in far more trouble,” says James. The current diet includes 12kg grass silage (40% DM), 18kg maize silage (28% DM), 1kg straw, 7.5kg Traﬀord syrup, 5.5kg lactose liquid, 3.5kg wheat, up to 2kg/cow/milking of a specially formulated 16%CP nut, 2.3kg protein blend, 500g AlkabupHa, 300g fat and 250g of minerals and yeast. Next Article Farmers Guardian caption competition No. 3 - winners!